The Denali is the top tier Acadia and this particular example is over $52,000 out the door. Compared to the lesser trim levels, the exterior receives a tasteful dose of bright chrome along the doors, door handles, and the exclusively styled grille. HID headlights with LED signature daytime running lights, painted lower door panels and bumper trim, and 20-inch wheels add to the upscale visual effect. 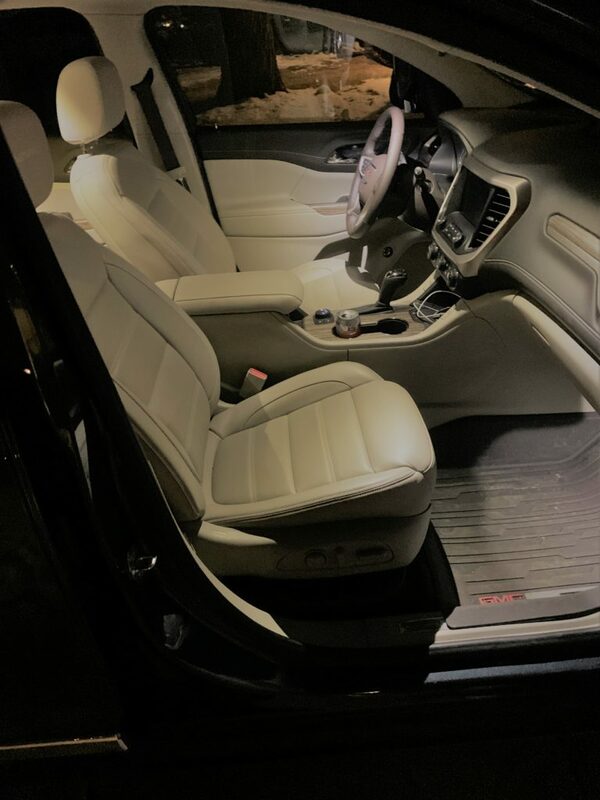 Inside, the Denali further impresses with heated and cooled front seats, a heated steering wheel, heated rear seats, and a remote start system that neatly integrates with the with those heated surfaces (your author is not a fan of being cold). The large and quick reacting infotainment screen is also easy to learn to use efficiently. The eight-inch infotainment touch screen is quick and easy to learn how to use efficiently. 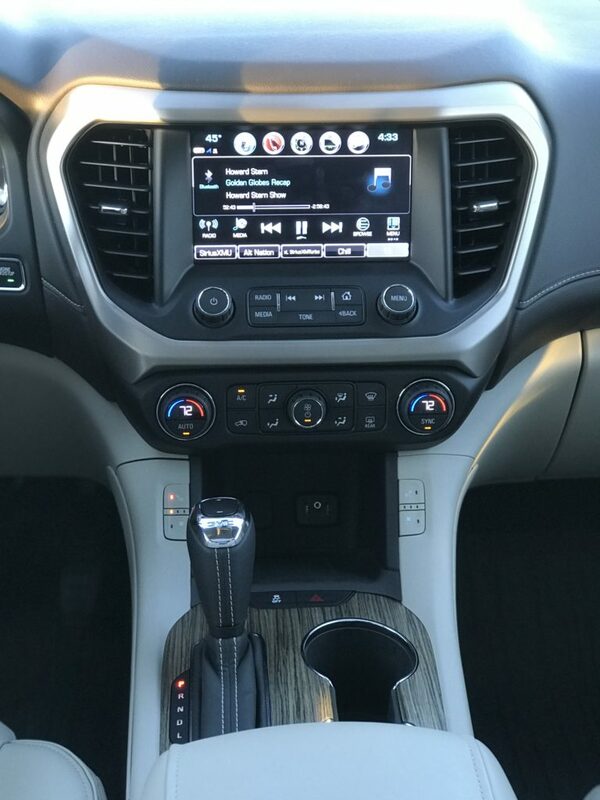 The latest in connectivity is included too, with Wi-fi, SiriusXM, Apple CarPlay, Android Auto, and HD radio while the sounds come through a 9-speaker Bose system that becomes more impressive with more volume but at normal levels, it’s nothing to write home about. 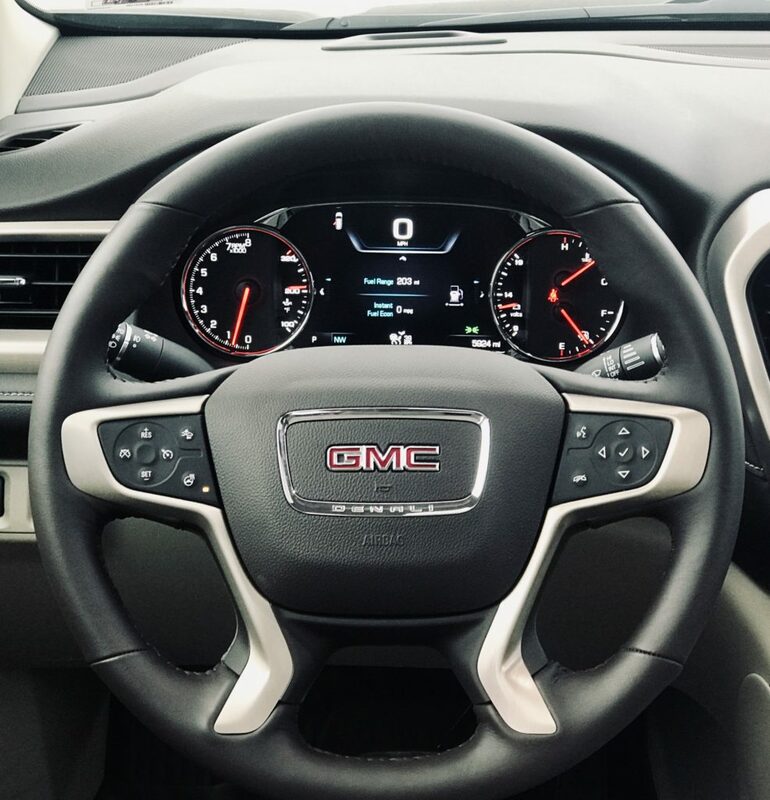 The Acadia Denali is equipped with an adaptive cruise control that works well with the Acadia’s lurch-free powertrain. At low speeds, the system’s minimum gap setting discourages opportunists from cutting in while the system proved invaluable at higher speeds when inclement weather made it more difficult to judge the gap to the car ahead. 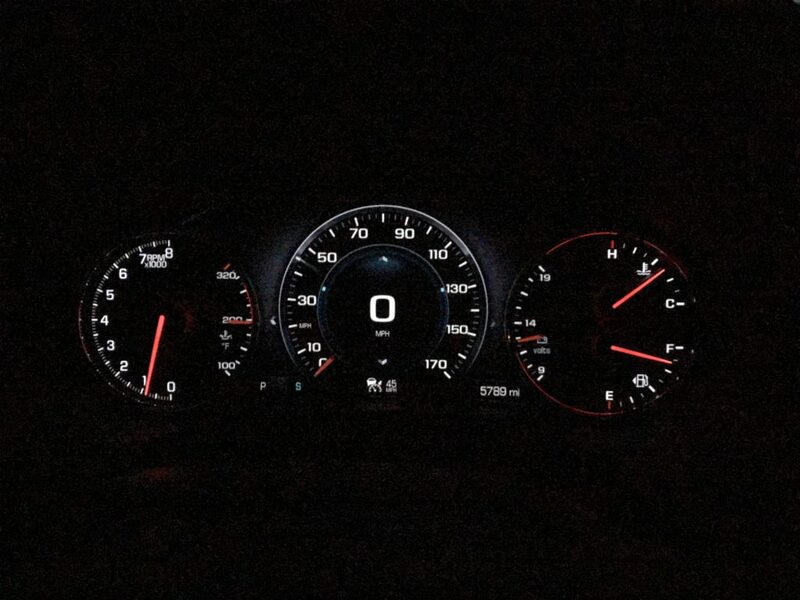 The digital display within the cluster helps to convey key information. The steering wheel’s metallic trim is literally a chilling contrast to its heated leather sections. Around town, the large A-pillar junction and the door mirrors create a large blindspot when checking around the corner. 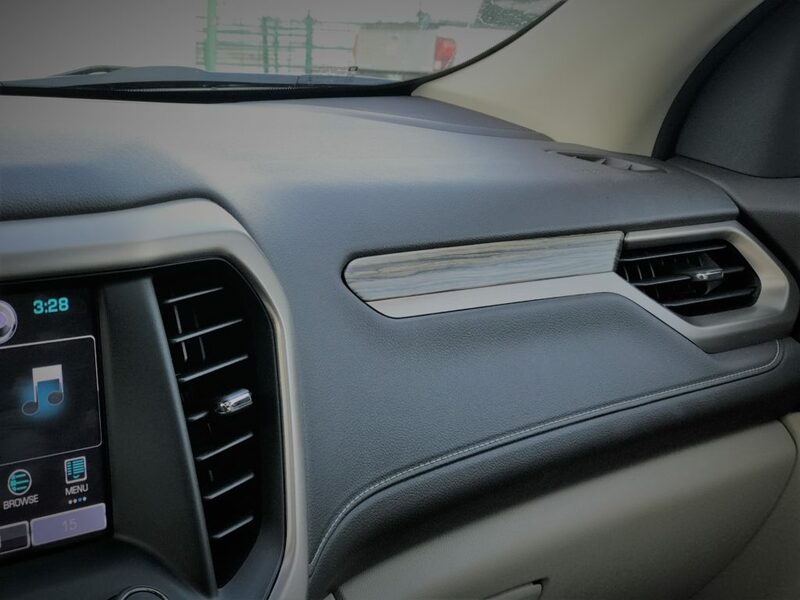 The view to the rear opposite corner is limited by the rising beltline and narrow rear quarter window, though the blind spot assist is reliable and subtle vibrating alerts are sent through the seat hip area. This is a great solution to get the driver’s attention without causing any unwarranted panic from the rest of the on-board crew. Low speed maneuvering is aided by the surround view camera. Additional chrome, 20-inch wheels and body-colored bumpers indicate a Denali trim. The Acadia earns Good crash test scores from IIHS and a five-star rating from NHTSA. The HID projector beam headlights lack adaptive curve control though they feature auto-high beams. 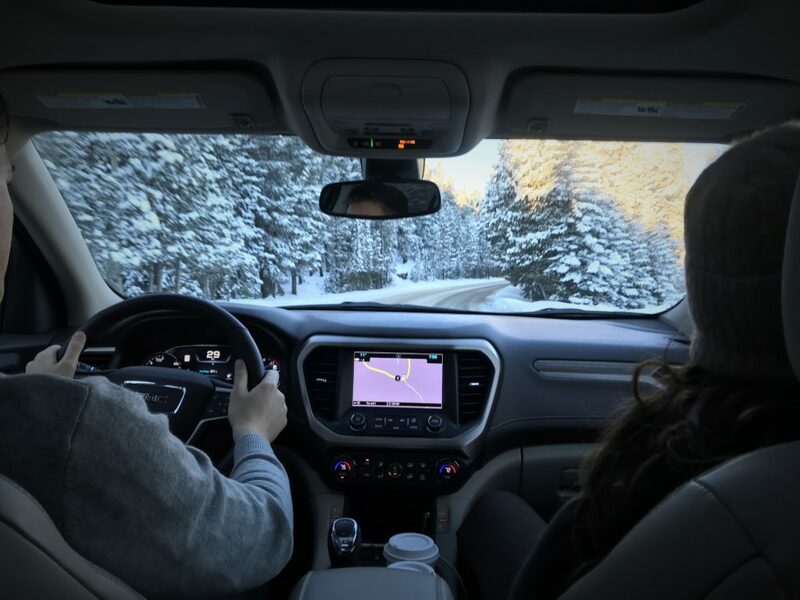 The exterior of the Acadia is sized within a few inches of the Honda Pilot and Ford Explorer but it’s down on interior cargo room, most notably behind the third row. 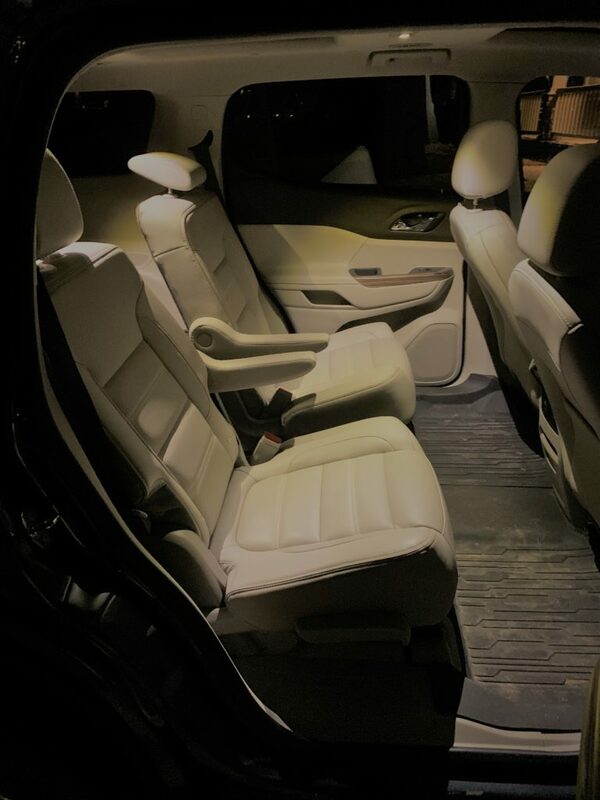 Fold that last row down and the cargo room becomes expansive while the 2nd row passengers still plenty of legroom. 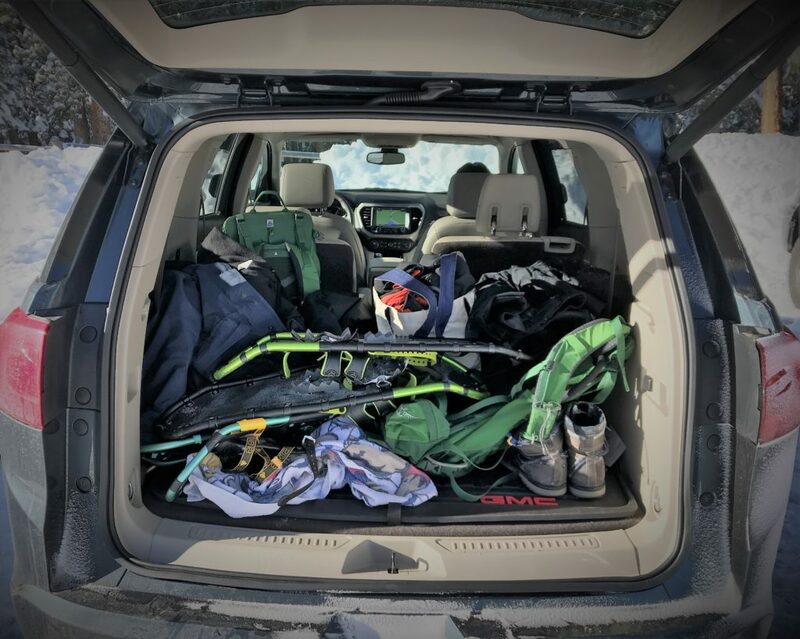 Plenty of room for careless packing of snow-shoeing gear. When necessary, the third row is acceptable for adults for short trips though getting in and out is far from a natural process. The optional split captain chairs allow for a narrow pathway to the back and add a sense of luxury though the obvious sacrifice to practicality unexpectedly meant a lack of legitimate cup holders too. 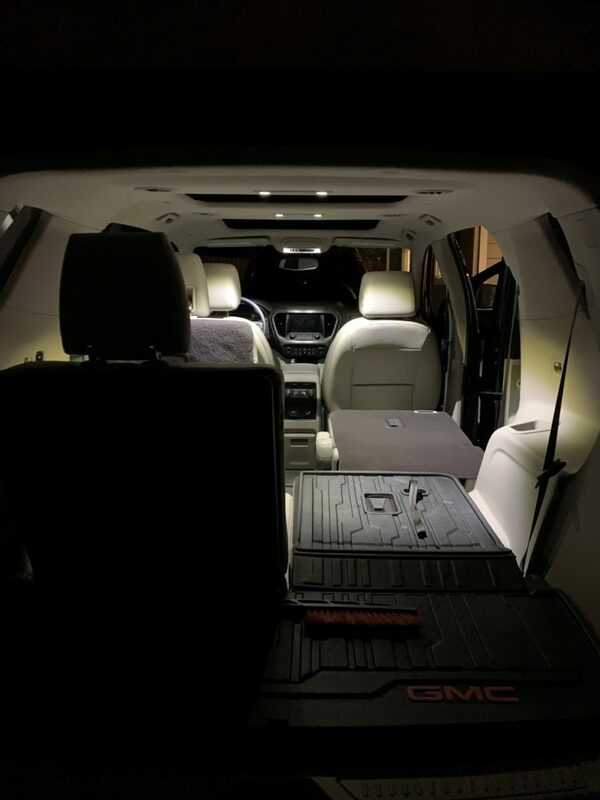 The interior quality of the Acadia Denali is not one of the Acadia’s strong suits. Inside, the driver and passenger are presented with a mixed bag of interior materials while misaligned trim is not up for debate. The exterior design makes a better case for its $50+ price tag. 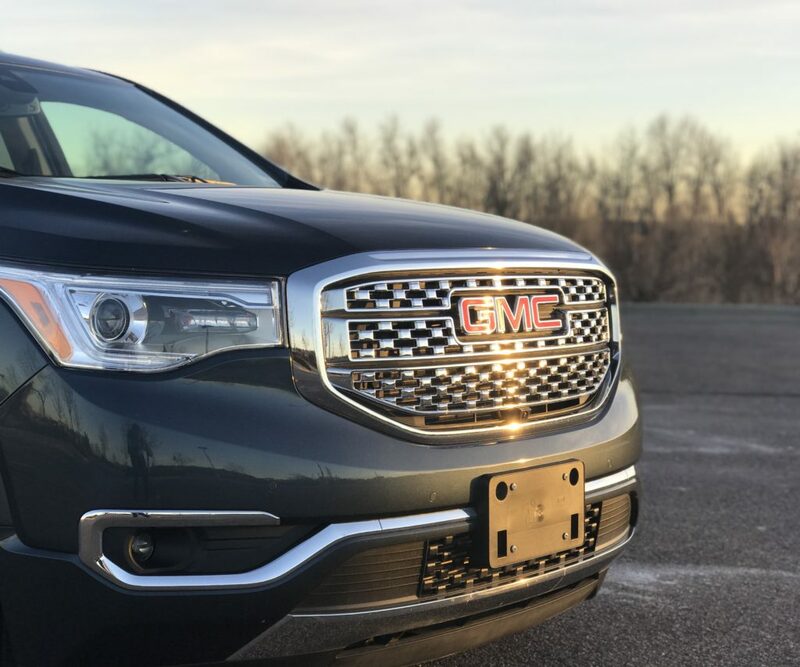 A short front overhang and pushed back front cab give the Acadia a natural appearance typically seen in rear drive platforms. The upright front end yields to a gradual rise to a steeply raked front windshield. Along the side, the window daylight-opening is traced with chrome trim and the side shapes are creased to pronounce the powerful stance. The rear quarter window design neatly wraps into the tailgate which has the typical crossover styling cues. 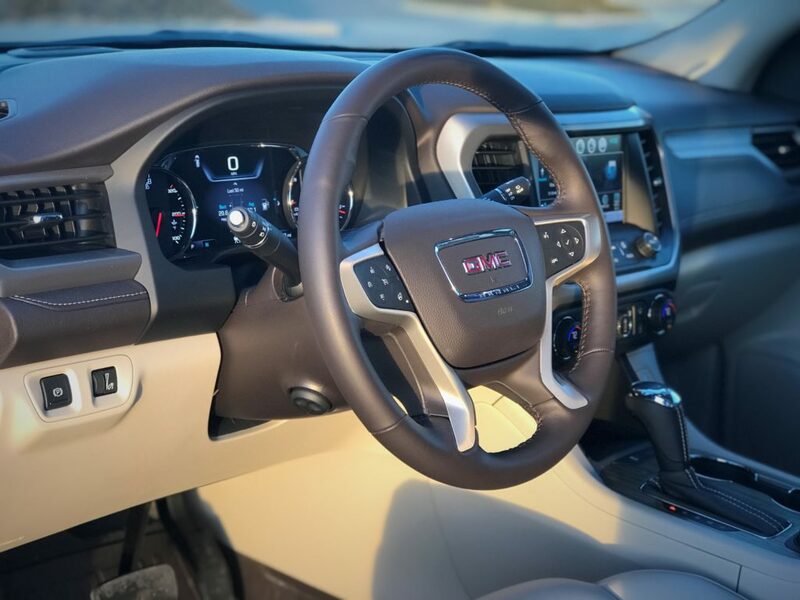 The top tier Acadia Denali receives the more powerful 3.6-liter V6 and a six-speed automatic transmission which is properly geared to make the most of the engine’s wide power band. The upshifts arrive often for the sake of fuel economy and slow for the sake of smoothness. On the highway, the transmission reacts appropriately to speed and throttle input for a downshift or two. The powertrain was basically flawless when put through the rigors of city traffic and highway cruising at high altitude. 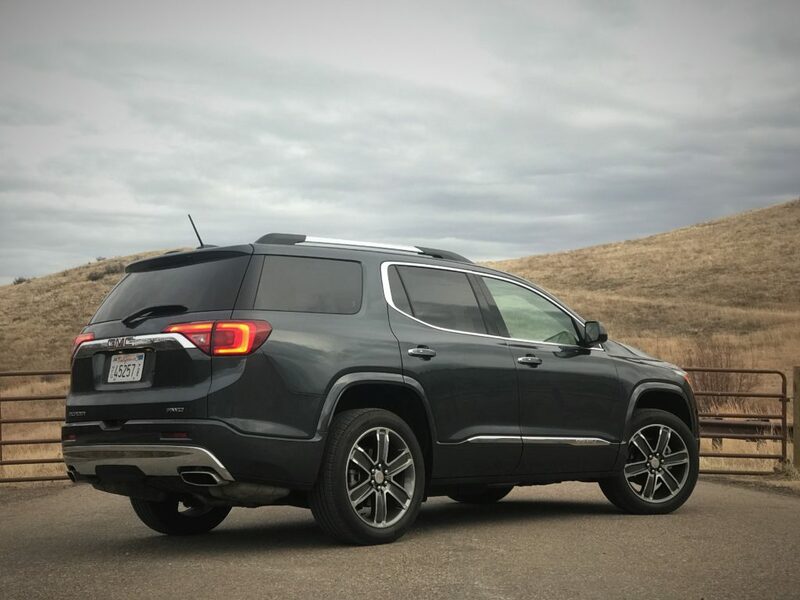 The Acadia’s V6 has a wide powerband and is well suited for high-altitude roads. 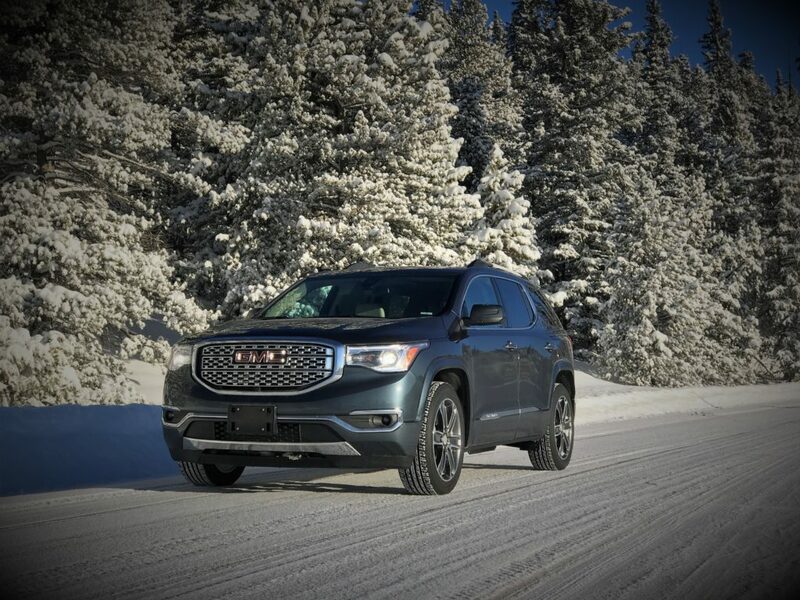 Just as in other GMC models, the Acadia features several different drive modes, including a 2WD, AWD, Sport, Snow, and Tow configurations which set the AWD readiness and stability control settings. 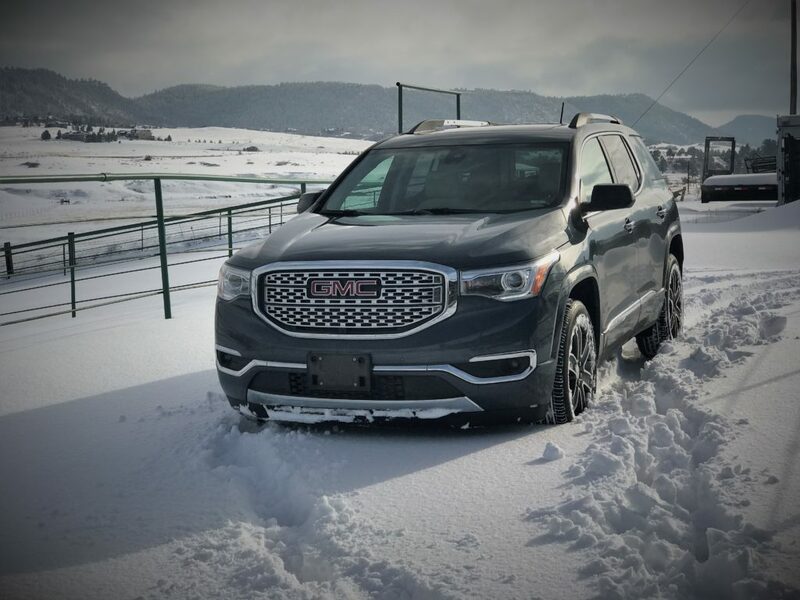 After a week left in AWD mode, the Acadia earned just under 22 mpg which is slightly better than the expected with EPA estimates of 17 city, 25 highway, and 20 combined. The smooth nature of the powertrain is equally matched by the soft ride. It does little to encourage any sense of verve but at low to moderate speeds the bumps are absorbed with little drama. 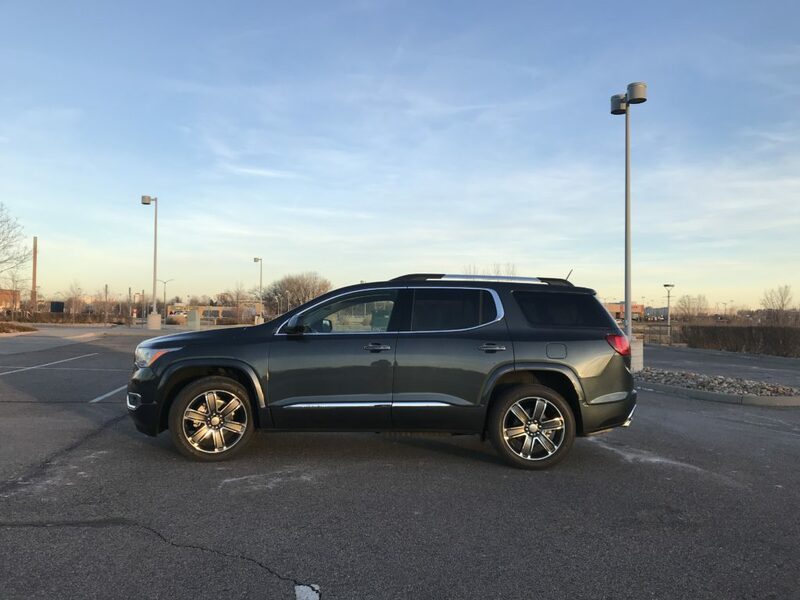 At higher speeds, the suspension can feel floaty when presented with a rapid series of bumps though for the most part, the Acadia is a happy cruiser. Be prepared for a fair bit a body roll if twisty mountain roads are involved but at least the brakes are up to the task and the brake pedal is easy to modulate. The steering feel is mostly mute though has good on-center feel while the stability control feels exceptionally well tuned for maintaining control without being heavy-handed. 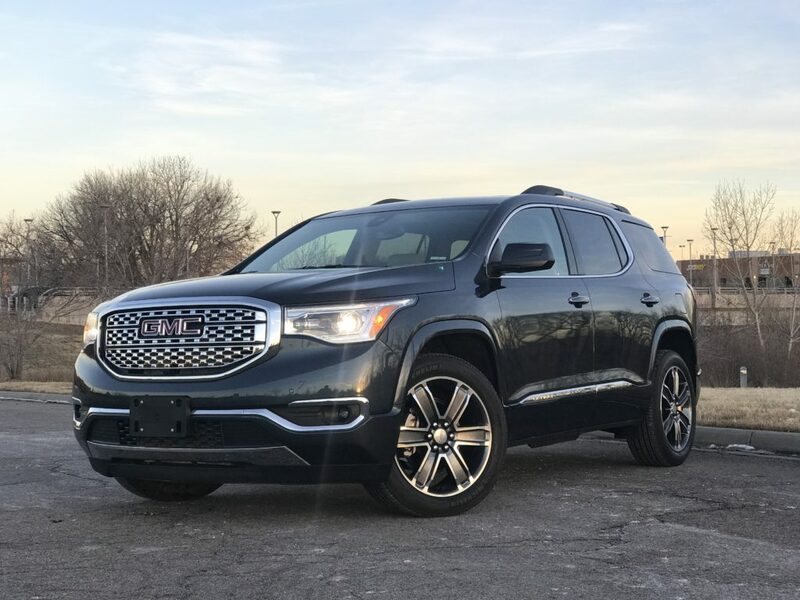 The Acadia Denali features a cohesive design while its extended body-colored trim and tasteful chrome additions help it achieve a premium look while the interior and ride are a couple of areas where the competition currently has the advantage.